Tag Archive | "Orange Saddle Fugu Puffer"
The Orange Saddle Fugu Puffer (Takifugu ocellatus) is found in Asia, primarily China and Vietnam and is often collected from the Yangtze River during breeding season. The Orange Saddle Fugu Puffer (Takifugu ocellatus) is also referred to by tropical fish keeping enthusiasts as the Fugu Puffer, Fugu Ocellatus, Orange, or Saddleback Puffer. The Orange Saddle Fugu Puffer has an olive green back, a white belly and orange eyes. Just above and behind the pectoral fins, there are two thick black dots outlined in orange to yellow that are connected to each other by a thin line over the back. There is also a black dot outlined with orange to yellow about the dorsal fin of the fish. Gender differentiation is difficult to impossible but during breeding season, the bellies of the female are larger than the males. The Obscure puffer (Takifugu obscurus) looks similar to Takifugu ocellatus and is likely a related species however, the lines around its black markings are cream colored to white, not orange and it grows considerably larger (up to 16″). The Orange Saddle Fugu Puffer requires a large, heavily brackish to salt water aquarium with a fine sandy substrate and some rockwork, preferably live rock and plenty of swimming space. They enjoy burrowing into the sand where they can easily hide and ambush their prey and because they are fast swimmers and easily startled, they need plenty of swimming room. Orange Saddle Fugu Puffers are extremely sensitive to ammonia and nitrites and must only be introduced into a completely cycled aquarium. Because Takifugu ocellatus are messy eaters, they should have an overcapacity filter on their tank along with a protein skimmer to remove unwanted pollutants and ensure water quality. The Orange Saddle Fugu Puffer or Saddleback Puffer is frequently collected in fresh and brackish water rivers during the breeding season. For this reason it is erroneously sold by many tropical fish keeping shops as a freshwater species. Consequently, they are not long lived in fresh water and should be gradually acclimated to heavy brackish or saltwater. In the wild Orange Saddle Fugu Puffers eat crustaceans, mollusks, sea anemones and hard corals. They are definitely not considered a “reef safe” species. 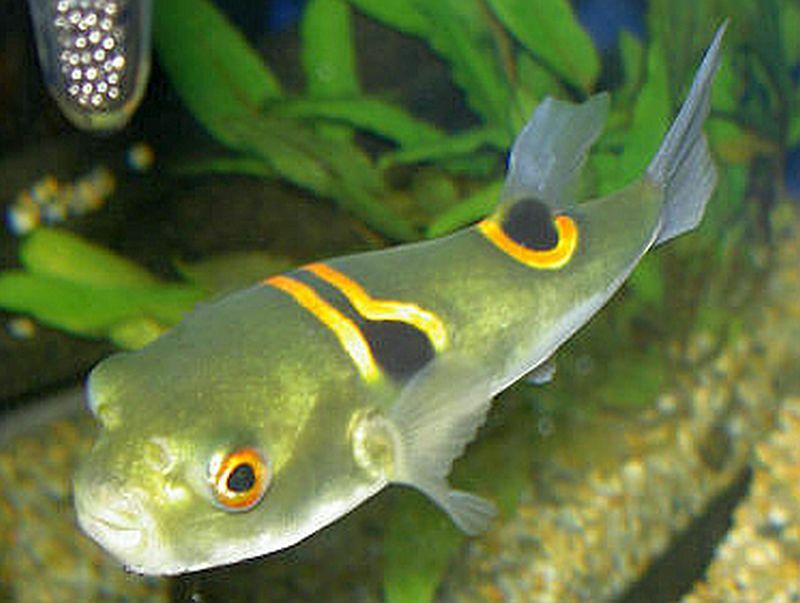 Although Takifugu ocellatus has not been successfully bred in this country, it has reportedly been successfully bred in captivity at Nanjing University in 1997. In an aquarium environment, the Orange Saddle Fugu Puffer is easy to feed and with the exception of fish, will eagerly accept and even beg for live and frozen foods such as krill, snails, shrimp, scallops, mussels, bloodworms, clams and other shellfish. Takifugu ocellatus is seasonally available to tropical fish keeping enthusiasts and is usually moderately priced.